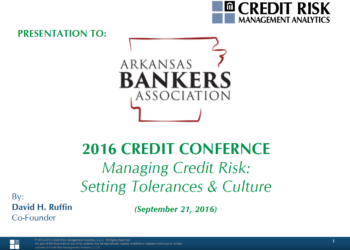 The statistics that David’s presentation provides on bank credit quality and portfolio trends is eye-opening. We were especially intrigued by the impact of Dodd Frank on community banks and their shrinking share of the market vs. the Big Banks’ (too big to fail) increased share of the market since the enactment of Dodd Frank (an outcome unintended by the legislation). David offers important ideas about where the banking industry should move relative to what we have learned from the financial crises, the recession and the resultant new regulations. Trends in credit quality of C&I loans are reflecting more credit downgrades and charge-offs by banks during the last 4 quarters following a longterm period of credit quality improvement. David Ruffin is Co-Founder and Chief Strategy Officer of Credit Risk Management Analytics, LLC, a firm that provides comprehensive credit-related products and services to banks throughout the U.S. A former banker himself, David’s career started with Planter’s National Bank in NC as Staff Credit Officer which ultimately led to him becoming a Senior Credit Officer at First Union in Charlotte, NC. He left First Union in 1989 to form Credit Risk Management Analytics.